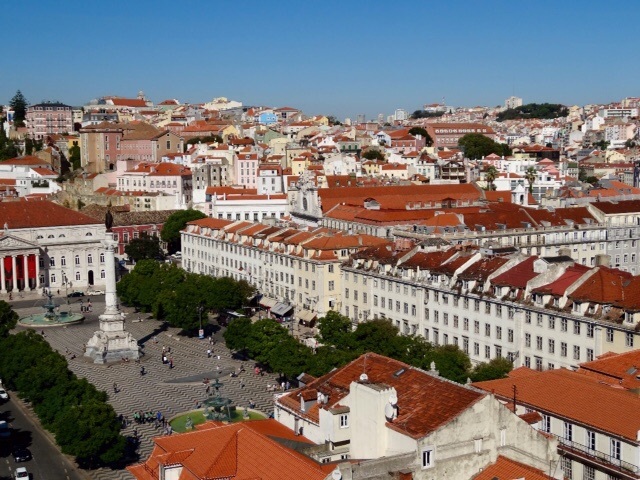 Lisbon is the capital of Portugal, with a population of three million people. 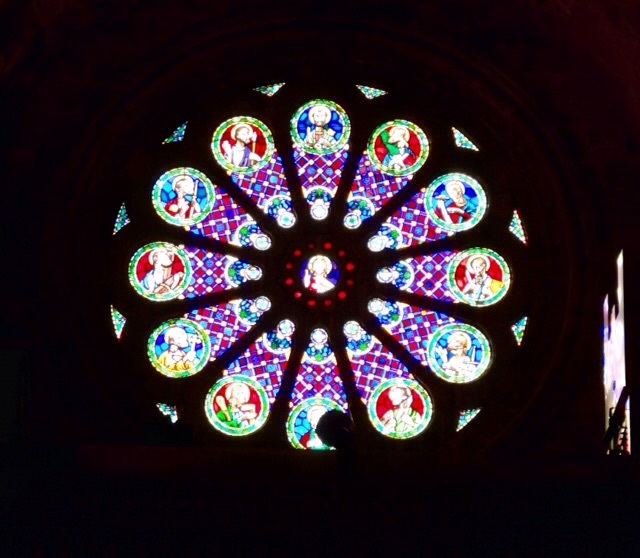 It is one of the oldest cities in Western Europe, predating Paris, London and Rome by centuries. I didn’t know any of that before our visit. 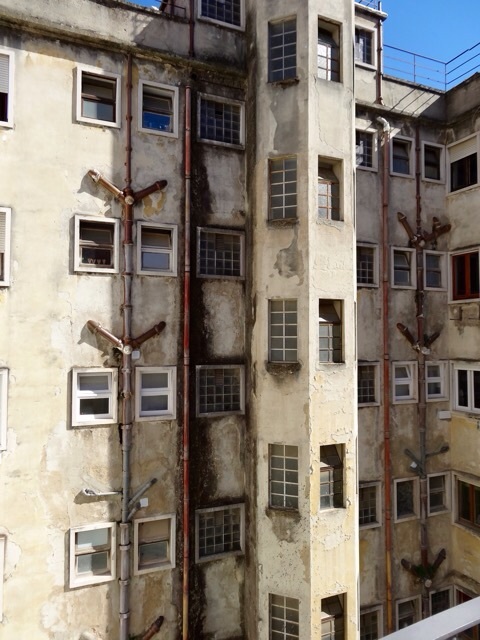 Although we spend the better part of the day in Lisbon, we barely scratched the surface of the area we visited. 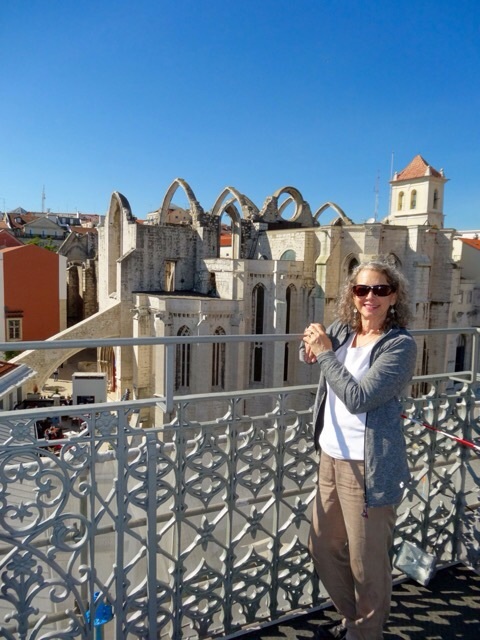 A twenty minute train ride into Lisbon places leaves us a short walk from the plaza in front of the Arco da Rua Augusta. 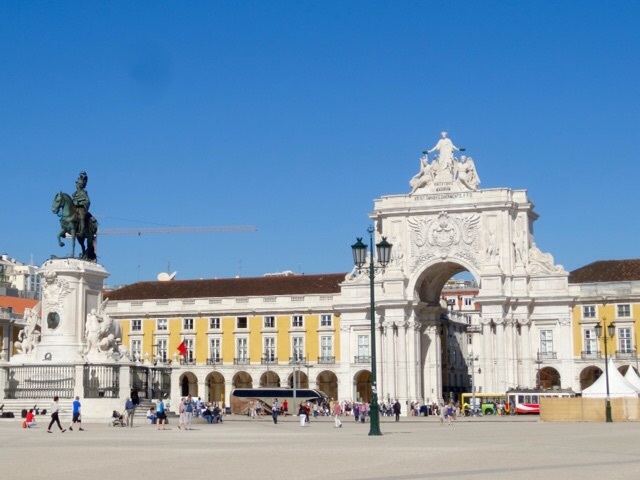 This arch symbolizes Lisbon reborn from the ashes of the devastating 1775 earthquake. 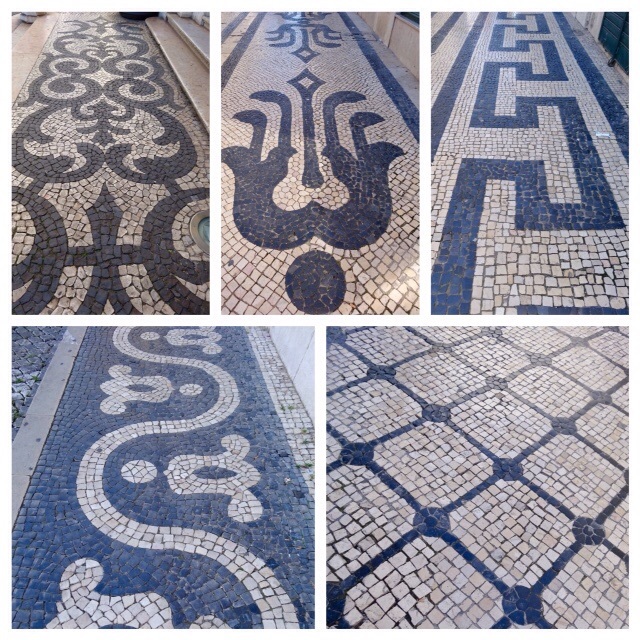 Lisbon is known for its cobblestone paving with black and white patterns. 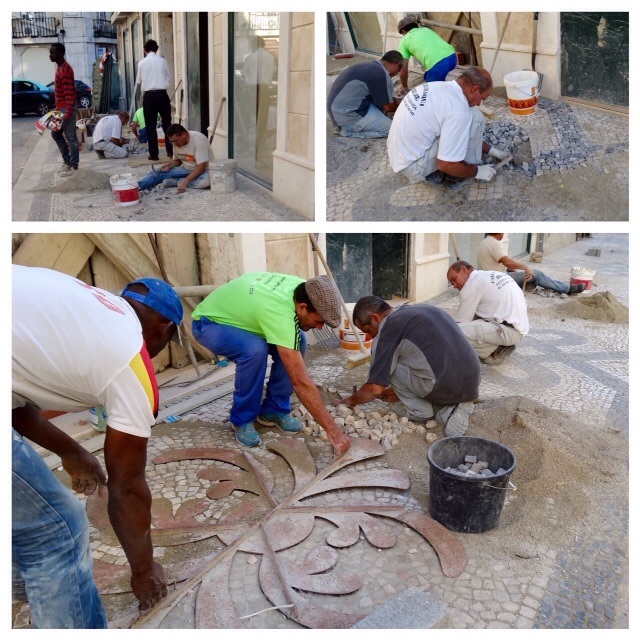 The origins of these cobblestone pavements date back to that 1755 earthquake. 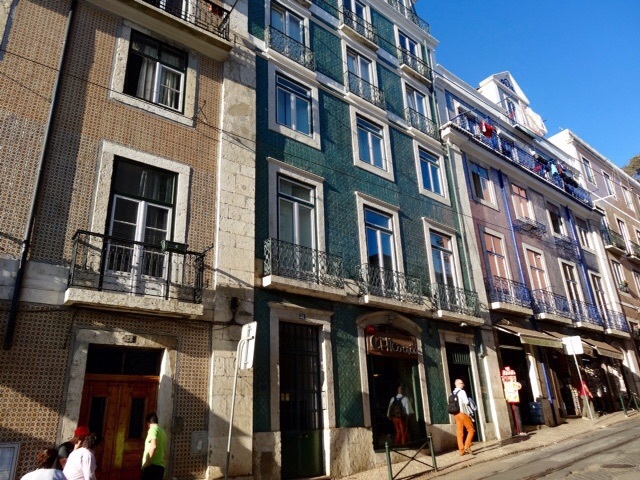 During Lisbon’s reconstruction, the earthquake’s debris was used to make these cobblestone streets and sidewalks. They are beautiful legacy from a terrible event. We were lucky enough to see some men working on a sidewalk. They were able to chip a stone in their hand to exactly the right size and shape that was needed. The man in the first photo was whistling happily as he worked, although i think it must be very hard on the body. The first thing on our agenda was to get a Sim card for our iPad. The Information lady said we could find a shop a few blocks up the hill, right behind the new elevator building. We never did find that, but we found a big mall and got a SIM card there. By this time we needed lunch, so we check out the mall’s food court. Bob got a huge plate with five kinds of meat, fried beans, rice, french fries, salad and a deep fried banana all for 4.65€, about $6.70 Canadian, and I eat my packed lunch. 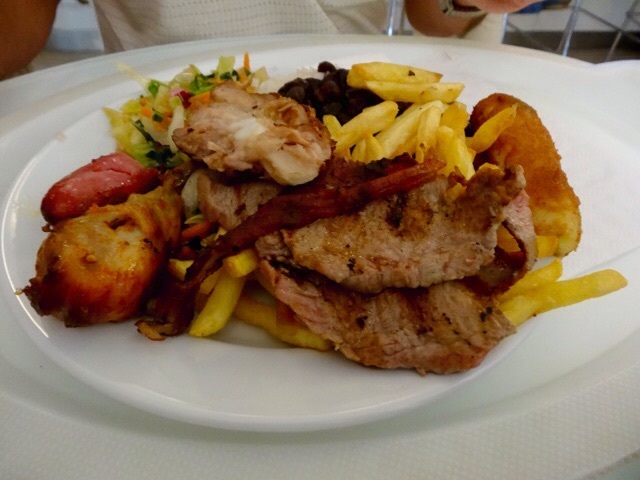 It is just too difficult finding food that I can eat, especially when I understand so little Portuguese or Spanish. It is easier and less stressful to pack my own meals. Next on the agenda was finding an art store to see if they could help me locate some life drawing venues. No luck there, but I did buy a few new drawing pencils. They sent me to the nearby Fine Art College, and after waiting some time, a lady there informed me that they did not have any drawing sessions for non students. If I had wanted to rent a studio to do printmaking it would have been fine, but nothing for drawing and they did not know of any life drawing places in the city. Remember this is a city of three million people! I couldn’t find anything on the intenet either, so I decided to quit trying. 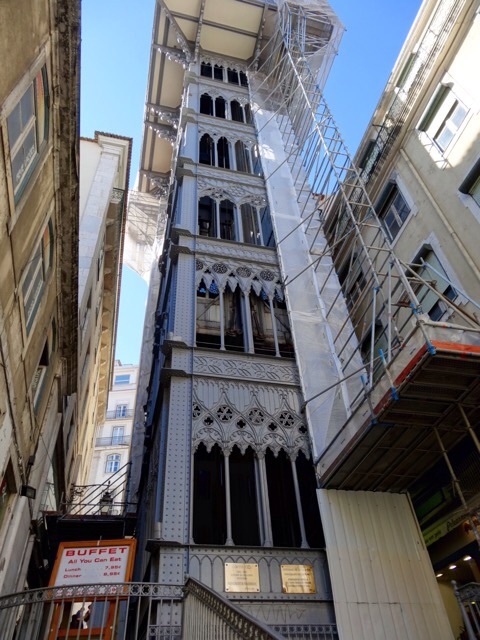 We did walk by the Santa Justa Lift, also called Carmo Lift, which is an elevator in the historical city of Lisbon, that connects the lower streets of the Baixa neighbourhood with the higher neighbourhood beside it. 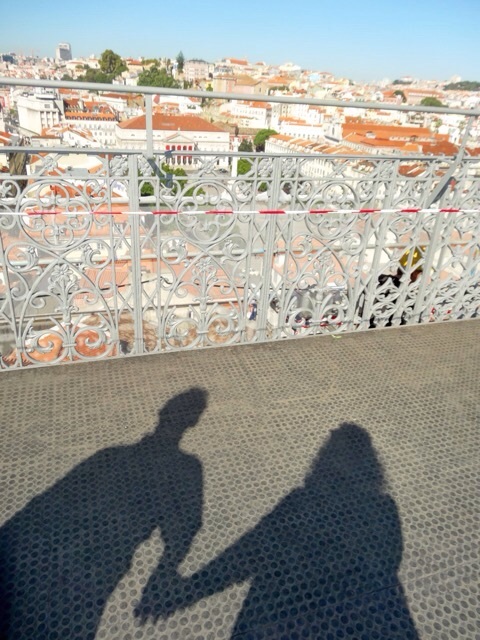 It is 45 meters high, and after a short wait we ride to the top for great panoramic views of the city. 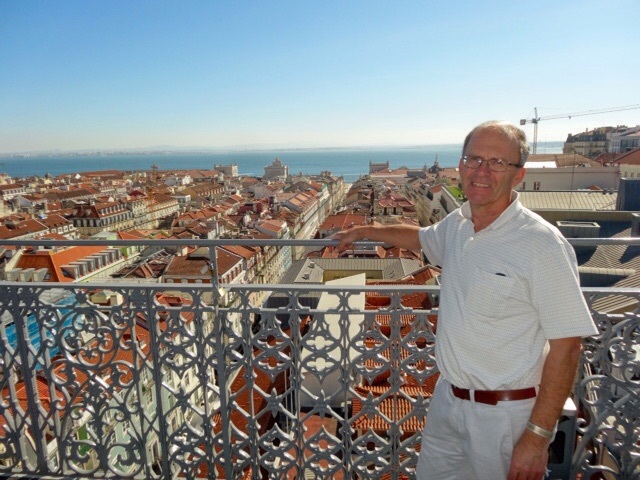 The panoramic views from the platform at the top of the elevator were spectacular. 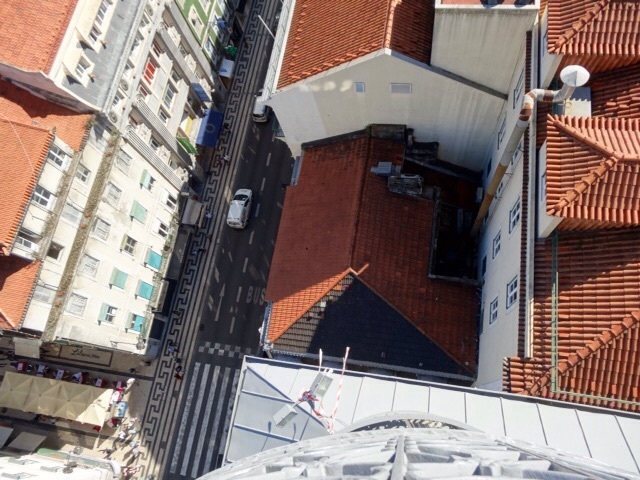 This one is for Pat, looking down from the the top platform, only 150 feet or so… but the crazy thing is that Lisbon is so incredibly hilly that on the other side of the viewing platform we are almost at ground level! If you look closely you can see people sitting on the patio just below where we are standing. I thought this was interesting. If you need to add toilets just run the pipes on the outside of the building. This sure wouldn’t work back home when it reaches -30°C! We take a quick free tour through a military museum about the Revolution in 1974 that put an end to the dictatorship that ruled Portugal for 48 years, then walked back down towards the old Jewish part of the town. 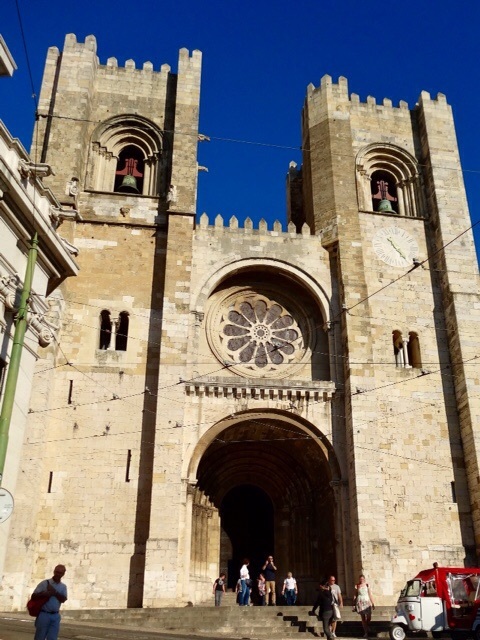 We visit the Sé Cathedral, which is the oldest Cathedral in Lisbon, its construction began in 1147, and it has survived many earthquakes. 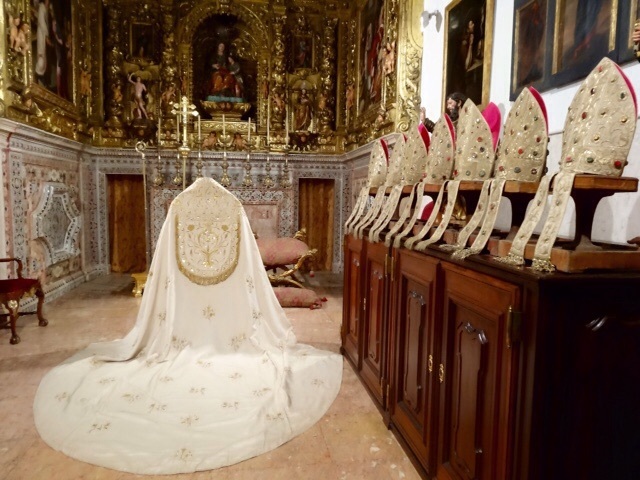 These vestments are from the 18th Century. I thought they were particularly beautiful. I have such a difficult time with people begging. Some of them appear to be in such desperate condition that it is hard not to give them some money, yet we are told not to do this as it only encourages more begging… This woman on the steps of the Cathedral wasn’t having much luck when we went into the church but when we came out she had changed into this posture and more people were stopping to put money in her container. Is it easier to give to someone who doesn’t make eye contact with you? 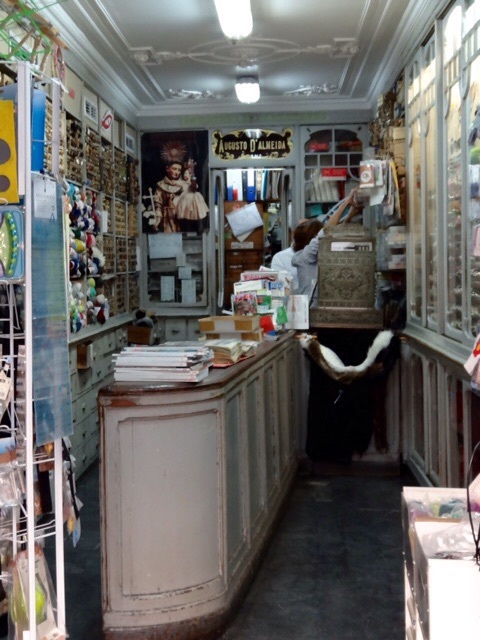 In the old Jewish part of town we walk down a street of tiny stores that sell buttons, and a bit of ribbon. I wonder how so many stores selling only buttons can survive? Many of the houses here are completely tiled. We decide not to walk any further as it is very hilly and we are should think about catching the train home. Walking home from the train I stop to take this picture and a lady on a motorcycle stops to tell me that she keeps forgetting to bring her camera to take a picture of these white birds, first in Portuguese and then in quite good English. 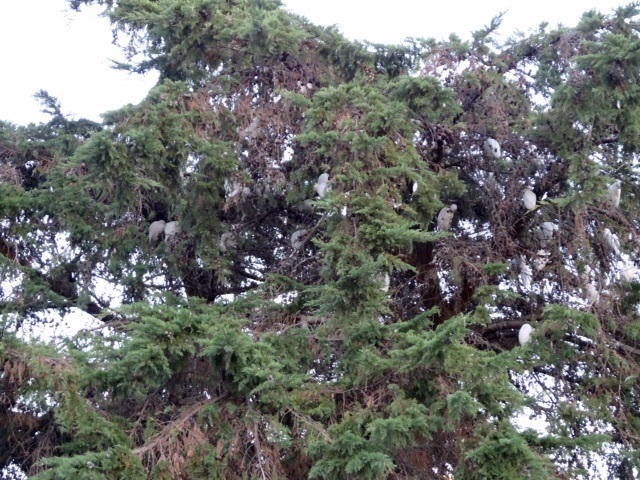 Bob counted almost thirty birds in this tree. 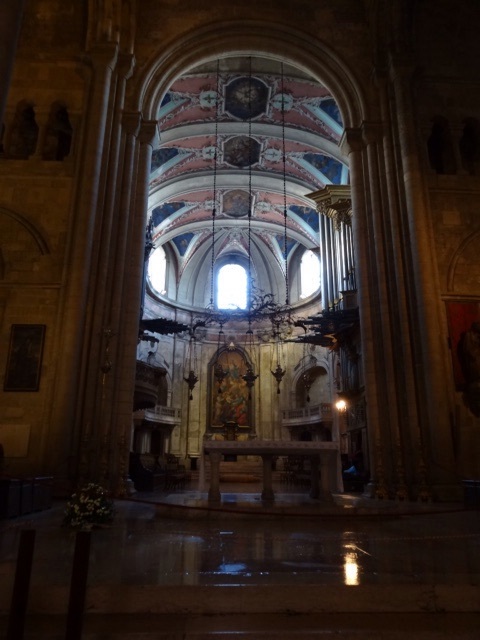 This entry was posted in Cathedrals, Drawing, Historic Buildings, Life drawing, Lisbon, Mosaics, Museums, Spain, Spanish Cathedrals, Spanish Museums and tagged Art, Churches, Life drawing, Lisbon, Notre Dame Cathedral, Spain, Spanish Museums by Trudy. Bookmark the permalink. You do have to be careful with the beggars, my husband couldn’t pass one without giving. It didn’t take long before they were at our hotel door waiting, begging and following us as well as trying to give us flowers and then asking for money. We also saw one with a baby, she wasn’t very successful at begging but that was probably due to the fact that she was wearing designer shoes.